The faculty of Financial and Administrative Sciences organized a visit to Ahmos Khalifa nursing home on Tuesday 20/3/2018 on the occasion of the Mother’s Day. This was held under the auspices of the Student Activities Department. 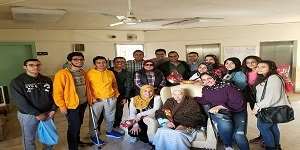 A number of the faculty students went in this visit where they spent a very enjoyable time with the elderly mothers and distributed flowers, gifts and some candies among them. This visit brought pleasure to the elderly. The coordination of the visit was managed by Dr. Nagwa Mohamed, the student activities leader at the faculty of Financial and Administrative Sciences.